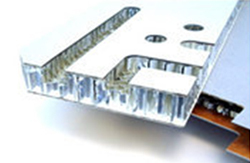 Ecocomb Aluminium Honeycomb Panels is composed of multi-layer aluminum foil; honeycomb is formed after the expansion. EcoComb honeycomb core and aluminium composite panel has sharp and clear hole surface, and it is suitable for adhering to high grade plate as well as other purposes. Ecocomb honeycomb Composite Panel is made from aluminum honeycomb core expanded into a hexagonal structure sandwiched by the various types of facings as per the applications which are then bonded together by a layer of aircraft grade adhesives and our propeitory developed joineries. These panels are lightweight, high strength structures that are very rigid and leakproof. Ecocomb honeycombs Aluminium Composite Panels have the best strength to weight ratio compared to any conventional construction technologies available currently. Aluminium Honeycomb Composite Panel is the Original Equipment Manufacturer choice in the Aviation (Boeing) and Aerospace, Automotive (Truck Bodies), Marine, Rail, Elevators, Exhibitions and Showrooms. Aluminium Honeycomb Composite Panel is now being used in countless commercial applications where strength, flatness and lightweight are needed. From the retail industry to high-end engineering systems EcoComb Honeycomb Aluminum Composite Panels are a cost effective option for any related venture. EcoComb honeycomb Panel is specified wherever high strength-to-weight ratio, energy absorption or directional qualities are desired. EcoComb honeycomb core is manufactured and offered in different configurations of cell diameters, thicknesses and densities. Wherever there’s a requirement for greater structural strength with less weight, you will find EcoComb honeycomb Composite Panel to be the product of choice. High Thermal & Sound insulation properties. Impervious to Fire / Water / Insects / Mould / Mildew.